I was shopping for kitchen supply and decided to swing to the household section to get an insect spray. Hubby had localized skin rashes he said was due to a mosquito bite. I wasn't sure enough if it's an insect bite since I'm also considering food allergy. Rainy season related diseases and health problems should not be taken for granted in every household. One is Dengue Fever, an infectious disease caused by dengue virus. With high incidents during the rainy season where a female Aedes Aegypti mosquito (the primary dengue mosquito carrier) can lay 60-100 eggs each time. But did you know there's a secondary vector of dengue virus called the Aedes Albopictus? It is now present in places where humans are staying. This dengue mosquito bites most aggressively from late afternoon hours and this biting behavior stretches until nighttime. So before we all become victims of dengue, other insect-related diseases, it's better to pest off these cause of these deadly diseases. Zika virus is spread through mosquito bite. Some of the signs and symptoms of zika virus includes rash, fever, and red eyes. With significant number of dengue cases the community should be informed of ways how to prevent and protect their family against the dengue mosquitoes. Preventive measures should not only focus on day-time cleaning but throughout the day. We are all familiar with insect repellent lotion, however, the threat remains present if we do not kill the mosquitoes carrying dengue virus. Besides, insect repellent lotion can be easily removed after washing. Other brands last efficacy after a couple of hours. Cleanliness in our surrounding and in the community destroying breeding grounds of mosquitoes is the best way. We can use insect killer spray unfortunately most of them are quite expensive. 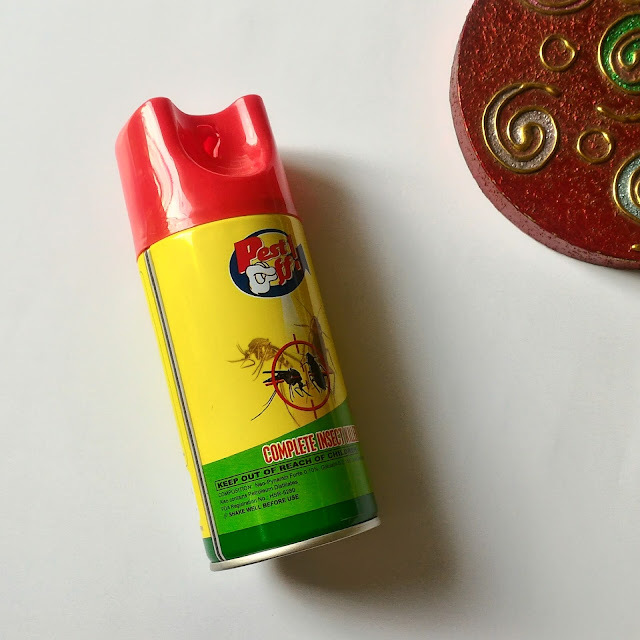 Thinking about hubby's skin rasher and mosquito bites, I thought the need to change the insect spray we are currently using since it's not that effective. I remember my friend recommended Pest Off! Complete Insect Killer distributed by GlobalWinds Corporation. It's cheaper compared to other leading brand. 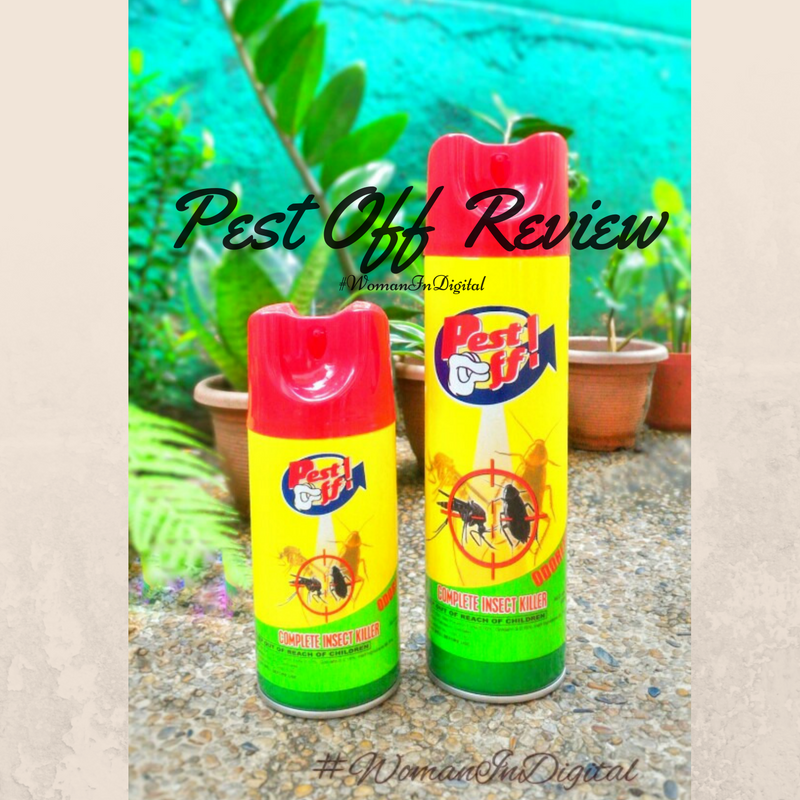 I got the Pest Off Aerosol and it says it has a special formulation that kills roaches, mosquitoes, houseflies, fleas, and other flying insects that can cause many diseases, not only itchy insect bite but also deadly food-borne diseases. I hate roaches, flies, mosquitoes the way that I hate mice, eeew! Pest off Complete Insect Killer back label complete with direction on how to use, precaution, first aid application in case of accident, and proper storage. I was surprised when I tried Pest Off Spray for the first time. Unlike most sprays, it's odorless. No scent at all. It has a spray nozzle that disperse right to the target. I tried directly spraying the ants crawling on my kitchen sink, they were gone in just one spray. Best of all, I never saw ants on that area again. That evening, I sprayed the kitchen cabinets where I usually kept other household supplies such as detergent soaps. It's been a favorite hiding place of roaches and mosquitoes especially during moist and rainy season. To effectively use Pest Off! 1. Close all windows and doors. 2. Directly spray on the flying insects. Spray in hiding places, sinks, and other areas where they live. 3. Stay away from the room for at least 30 minutes. Pest Off! 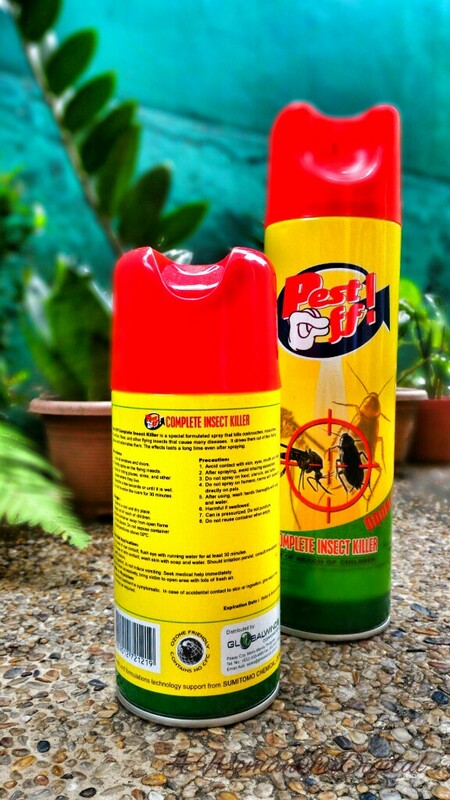 Complete Aerosol Insect Spray is available at 520ml and 260ml (Php132). I bought it at SM Hypermarket. A friend told me it is also available in Puregold Supermarket, Robinsons Supermarket, Shopwise, and Cash & Carry. You may also visit their page and find out other Pest Off products. Do you have household practical tips on how to get rid of insects at home? Have you tried using Pest Off? How's your experience?